My dad turned 70 earlier this year and for his gift I got a day on the water for the two of us to fish together. That was back in April and a lot went down between then and yesterday. One of those things was a health scare with my dad that threw this and pretty much any trip in question. 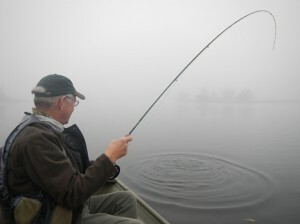 That fear seems to have abated (dad’s doing great these days) and so it was time to get fishing. We were going to fish the Lower Sacramento out of The Fly Shop. I love this river. It is big with big, big fish. We met at the shop, got all our stuff together and headed to the river. Um… WTF? You can’t go fishing in Chocolate Milk! Pretty much no one could predict that the river would blow out overnight for no readily apparent reason. We got to the boat launch, got out of the car and it was clear, within seconds, the Lower Sac was pretty far from fishable. The river had looked good the day before and there had been no rain for several days. The river had been clearing, not silting up. No explanation, just 4.5K of chocolate milk. So… on to plan B. My dad and I headed to some private water accessed through The Fly Shop which my dad had fished (and enjoyed) previously. We didn’t need the guide for that, so he went his way and we made our way south to a private lake called Luk Lake. It was cold and foggy, but there were fish. 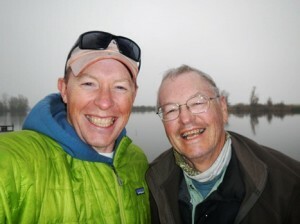 It was fun to row around the little lake and catch some fish with my dad. He actually caught more fish than me, which is one of those things that doesn’t happen too much these days. Another late birthday present. While I was behind on numbers, I did manage to catch the biggest trout I’ve landed in a few years. Now… I wouldn’t say this is a wild fish, or a pretty fish, or a spectacular fish, but it was big. Sometimes you need a big, ugly, frankenfish and that’s pretty much what I got. This thing was fat with a broad back. You can see the tail is a mess and it has one of those snub noses indicating it grew too quickly. 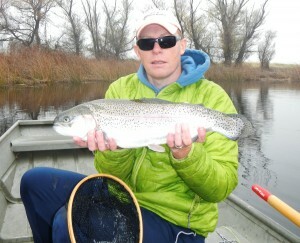 Still, it is a thrill to see that big, broad flash in the water when you see the flank of the fish for the first time. The day was about fishing with my dad, something I get to do too seldom these days. You can never fish too much with your dad (I hope my daughter feels the same). This entry was posted on Wednesday, December 12th, 2012 at 1:25 am	and is filed under All the other stuff. You can follow any comments to this entry through the RSS 2.0 feed. You can leave a comment, or trackback from your own site. Nice post. I have really been enjoying your blog. Keep it up! And, just for the record, I came back last Sunday from Mangrove Cay. Despite the strong winds (25-30 mph), wading and unguided, I managed to catch a few bones on my first trip down! I can not get bonefishing out of my brain. I know how that goes! Thanks for the kind words. I’ll keep it up.